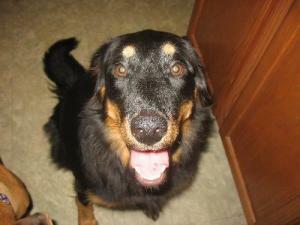 Shiloh is a sweet girl in need for a home. She is currently being cared for by project HALO (Helping Animals Live On), a no-kill rescue organization based in Charlotte, N.C.
Only 1½ years old, Shiloh shows severe signs of hip dysplasia and recently had surgery on her left hip. Rehabilitation took several months with water therapy, needed to built up enough muscle mass so Shiloh could bear her full weight on her operated hip. Shiloh has just regained her confidence again and starts using her left leg fully. She now is able to run around for brief periods and loves to play with her toys and doggie friends. She currently is on anti inflammatory and pain medication. The operation of the right hip is long overdue, but project HALO is in lack of funds to be able to perform this. 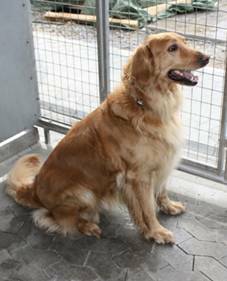 Donations to help Shiloh receiving her 2nd hip operation are most welcome. 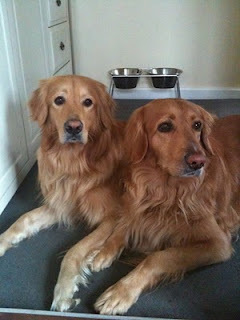 Shiloh has such a great diposition who gets along well with everyone. Her favorite pasttime is to give hugs and kisses. She is one of the most affectionate dogs the people of project HALO have ever met. She really just wants a family to call her own. If you are interested in adopting Shiloh or donate, please visit the website of project HALO to fill out an application or contact Rhonda at projhalo(at)bellsouth(dot)net for more information. More info is also available on Petfinder: Shiloh on Petfinder. I will also post updates with more info on this blog when it comes available. Shiloh is being followed by the Twitter community a lot. A big thanks to these twitter pals for spreading the word of Shiloh on Twitter. The first time we noticed Viva was a half year ago. When her first family had left her in the local shelter. As a dog lover with a weak spot for Hovawarts I followed what happened with her. She got quickly adopted, but things went wrong and she returned to the shelter again after some months. That's when me and my wife decided to adopt her. She had issues. She was overweight, flea-infested and had a poor skin condition. We took her to the vet to look at her skin condition. The vet gave us some Hill's prescription low-allergy dog kibble as she guessed it was probably a food allergy. We also ordered blood work to investigate further for other possible allergies. Unfortunately Viva couldn't cope the low allergy kibble and went down with some severe diarrea. We changed back to the original kibble to stop the diarrea. The vet got us some new, this time very-low-allergy, kibble. At least she could digest that but the whole thing made me uncomfortable. I don't know for sure if Viva suffers from food allergy as the other allergy test results hadn't come in yet. And not knowing what ingredients she would react upon, what would be safe for treats or snacks? The ingredients listed on the bag looked like something from which each living molecule had been removed. At the end I went along, better safe then sorry at this point in time. But I still have a bad taste in my mouth of getting pushed a Hill's sales pitch without a proper diagnosis. When we got results back from her blood work allergy test Viva tested positive on dust mites and fungus. The good news was that this was treatable with a vaccine that had no known side-effects, so we ordered that. Now we had the whole allergy picture laid out. And although not overly excited with feeding low-allergy kibble and allergy shots, it would do the trick. We decided to go for it also because we started to notice other issues with Viva that could be a lot more severe. Getting to know Viva better, other things with Viva started to worry me. She didn't seemed as mobile/agile as Kenzo. When Kenzo would land on her lower back when playing she seemed to be in pain and she stopped playing immediately. Also I guessed that the pain could be a cause for her aggressive, fear-based, behavior with some other dogs we met on our walks. We went back to the vet to have this looked at. The vet investigated Viva's back and noted something was there that caused pain. We went outside and I showed her how Viva walked. Viva drags her feet a little when she walks (sounds like walking with slippers) and she also moves slowly as if she is tired. And when she is running, I can keep up with here. The vet discarded that to be an issue, but wanted to have a closer look at her back. Again, like with the food allergy diagnosis that didn't feel right. We agreed to take x-rays of her lower back and got very bad news. Viva had spondylosis, a form of osteoarthritis. Three discs in her lower back were affected and were growing towards each other. This caused inflammation and pain. When left untreated, other discs would follow, resulting in a back as stiff as a board. The vet gave us a glucosamine and omega3/6 food supplement which is good for the inflammation and prevents the spondylosis from spreading. So far so good, but when she also suggested pain-killers and possibly also steroids, we thought that now it was enough. The total picture of Viva on low-allergy kibble, treated with agressive medicine and some of her signs neglected just didn't cut it. It sounded like a future of side-effects and new problems. Inspired by my Twitter pal @dawgblogger on the possibilities of traditional Chinese medicine (TCVM), stem cell treatment, etc. we went looking for another vet. I found a vet that studied Chinese medicine in China itself, specialised in joint problems and an advocate for alternative treatment giving seminars, teached on universities, etc. She got her Ph.d. on that subject and travelled the whole country to handle the difficult cases everybody else had given up. So we visited the new vet. Her approach was completely different. When we arrived we started with going on a walk where she observed Viva. Without me telling her she quickly noticed the same issues with Viva's walk I noticed before which our own vet had discarded earlier. After that we went inside and she did a physical examination, with a lot of feeling and rubbing Viva over her whole body. She concluded that the problem was not only the spondylosis in her lower back but also that her weak muscles were not able to support the back properly and had to be strenghtend. It was probably a result of Viva over a longer period trying to walk in a position that would give her the least pain. She was not sure that even more could be wrong, also because the right hind leg reacted differently to some reaction tests she did. But we had to move the muscle problem out of the way first to be able to see if more could be hiding. We agreed to start a treatment with acupuncture for the pain and an exercise program to start training her muscles. Involving swimming in a pool with a treatmill and do a lot of walking up hill. Viva got her first acupuncture right away and we started the exercise program. The vet suggested to do this for a couple of weeks and then to re-assess the situation depending on the progress Viva has made. She instructed me to be on the lookout for any change in behavior that might indicate Viva was in less pain. In the mean time we can also talk allergies and nutrition again, as she suggested there are other options then low-allergy kibble. And she wanted, like me, know what ingredient triggered Viva's food allergy. But she stressed to work on her back now first, as the allergies seem to be/get under control with what we were currently doing. I liked this. She noticed a lot more of what was wrong with Viva. Without even looking at an x-ray or other info. One thing in particular I noticed which I thought gave a lot of hope. When she was examing Viva and pressed on the top of her back, it looked stiff as like you would press on a woaden board. She repeated the examination of her back after the first acupunctur treatment, and I it was clearly noticeable that Viva's back reacted with more movement and flexibility to her touch. And that is where we are now. Will undoubtedly be continued. For more information on treatment of joint problems, allergies, Chinese medicine, stem cell treatment and a lot more, please visit @dawgblogger's blog. On these topics it is one of the richest and most clear sources of information on the Internet. One thing is for sure. Even Viva is struggling with her health, she still enjoys every day with her new family, Kenzo in particular. We have been on a vacation, started training in obedience and tracking on our own and have already been on lots of dog walk adventures. And she enjoys it as much as her health will allow it. Probably even more then that. For us it is an absolute joy to see her getting better mentally. We hope her health will follow soon. And that she will have a great "second part" of her life. 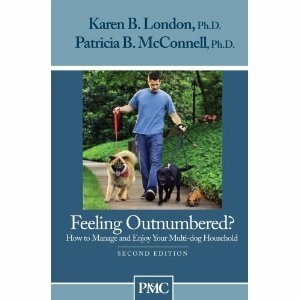 This 50-page booklet is a quick how-to guide for anybody having difficulties with their multi-dog household. It explains how to train group commands so you can get control over the situation: when eating, playing, greeting, waiting and walking. 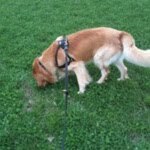 The social skills of all the members are also put under the loop, and how you can help your dogs to ensure that interaction is done on a polite manner. 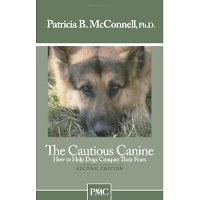 The booklet also provides a good checklist with signs that would indicate looming conclifts between your dogs. Preventing them is better then curing them. It provides enough depth to tackle the basics and gives tips on further reading if you would need that. Some basic knowledge on how to train an individual dog is more or less required. The booklet mainly adds the group dimension to your existing toolbox. This 30-page booklet gives you a quick walk through of the possibilities to help dogs with their fears. Don't expect the actual treatment to be just as short as this booklet, the author also clearly manages any expectations you might have for a "quick fix" on page 1. It is not possible to cover a complex subject as behavior based on fear in a booklet, but the author manages very well to give a good overview of how a treatment schedule could look like in a five step program. She indicates what all the key factors are you should be aware of and follows up with some recommendations for further reading. What I liked in particular was that it describes hands-on and real-life situations you might encounter when following the five steps. This booklet will definitely get you started, no time to waste. The only thing I found disappointing was that the examples, although the booklet uses a lot of them, always elaborated on the same subjects: meeting new people, or the mailmen or pizza boy at the door. And there are lot more factors that can trigger fear in a dog. Instead of elaborating on the same examples, different examples could have been used like fear for other dogs, sounds, crowds, etc. The Hovawart is labeled as a dominant dog. Let me share Kenzo's story with you to see how dominant they can be. Or not be. Kenzo, the Alpha wannabee puppy? When we got him as puppy, now more then 2½ years ago, little did I know about the breed. Trying to be prepared I read some books recommended to me and talked to other Hovawart owners. It was clear to me that this cute little fellow soon will try to challenge my position as the pack-leader. Especially with Hovawarts this was supposed to be the case, as the self-assured dogs they are. So I started from the start with being a pack leader. You know. Move through the door first. Eat before the dog eats. Dog cannot be above (couch, stairs) you. Etc. We went to our first dog training class just before the start of his adolescence. The trainers knew and heard about the Hovawart breed and pointed out to me I had to become more of a leader otherwise ... They wanted Kenzo to do what I said he should do, no matter what. Not following a command would first trigger the "No" word in increasing levels of volume, and eventually a leash correction. Well that definitely didn't work. Actually I could see Kenzo's contact now starting to focus away from me. The "breakthrough" came when one of the trainers jumped in to help me and show how to do it. Kenzo didn't move. "See, he wants to dominate" the trainer said. She tried again. Kenzo didn't move. Then she called upon the other trainer "Come and help, we have a real alpha over here". Basically I didn't know what was right or wrong, but based on Kenzo's obvious discomfort, I decided that enough is enough and we called it a day. Coming home and thinking things over I remembered some advice I got from our Hovawart breeder which first now started to make sense to me. You cannot rule a Hovawart. 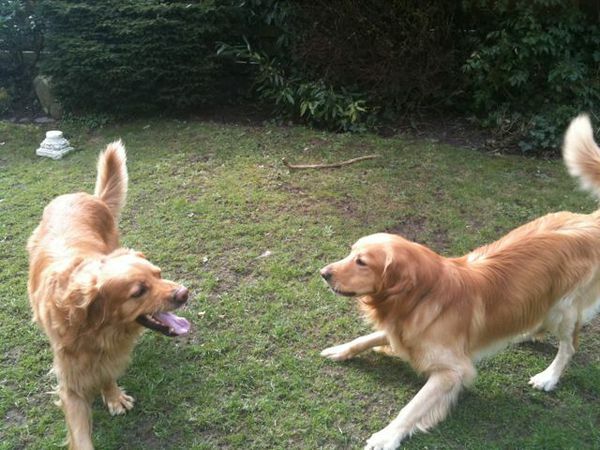 I started to follow up on that because why can Kenzo and me work together when training on a daily basis for fun. And not in training class. Fun is the difference here. Kenzo works based on some kind of partnership with a mutual form of respect which we both enjoy. Not on an alpha ruled relationship. The solution was obvious, find a training class with a trainer that works based on these principals. I found out there were a lot of those out there. Kenzo and me are now working happily together without one of us trying to dominate the other. Just because we both think it is fun. I also stopped all those Eat-before-the-dog-eat rules, and it has made absolutely no difference at all. Another thing that puzzled me was the theory of the hierarchy in the pack. To establish the hierarchy my wife also had to enforce the pack leader rules. I was a little worried, as she is laid back and didn't enforced any of those rules for very long. OK, she doesn't want Kenzo on the couch or in the bed but that's for other reasons. This was kind of worrying me, what if Kenzo didn't see her as pack leader? Since the pack hierarchy theory is something based on Wolfe behaviour with a strict line-of-command, it made me wonder if Kenzo would try to move up the ladder. But he didn't. Then there are the dogs he played with, came over to visit, and also other family dogs that went with us on family vacations. I couldn't see any sort of hierarchy exist. Sure one dog has resource guarding issues, the other has not. But when thinking of moving through the door opening, they seem to do that in random order. The resource guarding dog was labeled as dominant btw by his owner. Nice excuse not to do anything about it I guess. I was discussing this with another Hovawart owner which had the opinion that Kenzo just not is a dominant dog and his dog is. Happy to have made some kind of point, because in that case we can at least agree that not all Hovawarts are dominant, I also asked him what he did with his Hovie. He did not do any working dog or obedience training other then one obedience class in the start, kept him a lot outside during the day, but did made long dog walks with him. I couldn't convince him but you are probably guessing what I am getting at. The lack of a job just made an unhappy dog, not a dominant one. The other owner needs some kind of harshness to keep his not so happy dog from rebelling. I still doubt that Hovawarts should be labelled as dominant. They are just working dogs that need a job to be happy. They can get a job by attending tracking, search & rescue, "Schutzhund", etc. training classes. We use the dominant word as an excuse not to give our dogs what they need and covering up issues they might have. But I still doubt because I am neither a professional dog trainer or a behaviorist. You will have to make up your own mind when you own a Hovawart. But what I hope you will do is think twice before labelling your Hovie as dominant, and see if there is not something that he needs which you should provide, or if he has an issue that needs to be solved. The correct diagnosis is half the work. Just for the record, the trainers didn't do anything harsh to Kenzo and the other dogs involving real punishment or alpha-rolls. And I learned a lot of them on other areas. I still have a lot to thank them for. Did you enjoyed your first track? Hope you did well. When both of you are in for some more advanced tracking, the next exercise will help you to prepare. The first track was in a straight line all downwind. Before adding more complexity by making turns on the track and let another person lay the track, how do we know if the dog followed the track correctly? We cannot pick up the scents on the track and cannot double check what he was doing. Adding distance, turns and another persons scent on the track will soon leave us clueless of whether the dog is still following the track or not. When going downwind and meeting a turn, the scent will turn with the track but a part of it will be carried straight ahead by the wind in some distance. The dog can overshoot the turn, follow the scent carried by the wind, and then get lost. Here you come in the picture. Now is the time to show that tracking is team work. How can you recognize the overshoot and how can you help your dog back on track? Her the dogs body language comes to the rescue and will tell you what is happening. Not all dogs use the same body language while tracking, unlike the universal body language used to communicate with other dogs and humans. You will have to study his individual body language. When you can recognize his body language, you are ready for more advanced tracks. What we need is a track with different wind directions where you know exactly where the track is. All the time. Introducing the circle track. A track laid down in a circle covers wind from all directions. To lay a circle track put a flag/marker in the middle of the imaginary circle you are going to draw, attach a long line to it, and hold the end of the extended line in your hand and walk in a circle. Lay the circle track as if it was a first track: make a starting triangle, start downwind, walk heel-to-toe, a treat every other step, use a start and end flag, lay an object at the end. 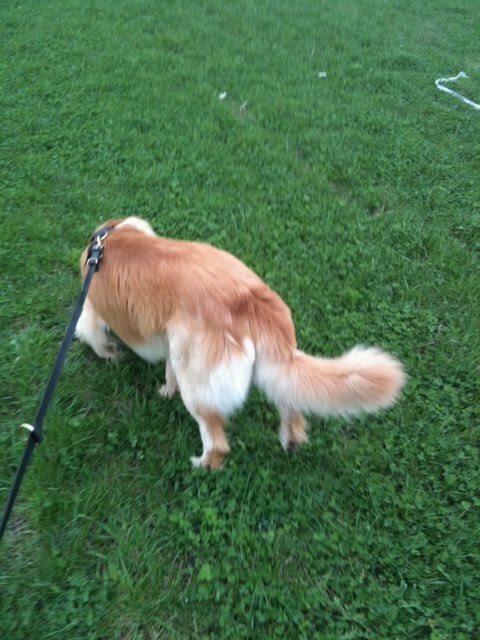 Now hope your dog has not already become so good that he follows the circle like a vacuum cleaner, but that changing wind directions throughout the circle force him to keep focus on the track in a subtle way. The circle shape will also support the transition from a straight line to real turns. Study his body language. What happens when he goes slightly off track. Look at his body posture, the tail position and if he is wagging his tail or not. Tail down, he probably lost the track. Head up? No clue yet, thinking about his next move. Tail up, found it again. Wagging? going on the track! You are getting prepared. Hang in there, one more exercise to go before we start advanced tracking. Enjoy! Dogs love to find and follow scents. They discover the outside world with their nose. Its what drives them to go out for a dog walk. Tracking plugs directly into this elementary need. Making tracking one of the most rewarding training forms for the dog. Teaching a dog to track is not difficult at all. They can already do it. And we can learn to be a part of it. Do you like to give it a try? Here is how to go your first track. The next two videos show how to lay and go your very first track. After the videos there will follow some more detailed instructions. Now that we have laid the track, we are going tracking with Viva the Hovawart. She joined our family recently and I have only done some "find it!" excercises with her, so this will be her first real track you will see! For the sake of the video I made it difficult for her by crossing a path in the field where I laid the track. That way I am sure she will go off the track and I can show you what to do. So far a quick video introduction. Did you notice how natural it was for Viva to follow the scent? Dogs just do that, the only thing we have to teach them is to follow the same scent and mark objects along the track. Now some more detailled instructions to help you on the way. an object like a cell phone, a purse, etc., what we want the dog to find by tracking. When you and your dog start to enjoy tracking there is plenty of opportunity to buy special tracking gear. To get a taste of tracking, the above will do just fine. Find a grassy area which is as undisturbed as possible and where there are not too many distractions. Going to a busy park can set you up for failure, as your dog will find many tracks and also see and hear things that might be of more interest then going tracking with you. Tie your dog to something or let somebody hold him. Now you can start laying the track. The track should always go downwind. This will force the dog to put his noise down to find the track. Mark a triangle in the grass the size of your dog. Trample/stomp all the grass inside the triangle. Put a flag in the ground left of the triangle so you have marked where the track starts. Start to walk in a straight line. Make small heel-to-toe steps and leave a treat beneath every other step. The first track shouldn't be long. We just want to have a success out of it and have the dog to learn that following one particular scent track will lead to a reward. You can make longer tracks later. A track of max. 30 meters will do. At the end of the track, lay down the object you took with you and put some treats on top of it. Now take 5 big steps forward and put the second flag/marker in the ground. Return to your dog in a big circle, well away of the track you laid. Now we have a track that is made up of human scent and the scent of crushed vegetation that the dog can follow. Wait at least 10 minutes before going the track. That will allow all the scents to start settling in. Don't worry about taking too long time, the ideal time to follow a track is after 30 minutes. Put your dog on the leash and give him the "down" command, so that he is laying inside the triangle at the start of the track. Try to calm the dog and wait until his nose comes down and begins to sniff in the triangle. If necessary motivate by moving your fingers through the grass in the start of the track. When the nose comes down and the dog begins to sniff he has picked up the scent. Immediately give him the "track" command, and make a forward move with you body encouraging him also to move forward. Let him follow the first steps and discover the first treat. Follow behind the dog with the leash extended as much as possible. Use the flag/marker at the end of the track to check if the dog is still on the track. When you are on track just follow to dog. No praising or sounds at this time, that will only distract the dog. When you can see the dog is off the track, stop walking. And here again, no commands whatsoever. The dog will start to circle trying to find the track. As soon as he finds the track again, follow. First when you see the dog is making no effort to find the track or is distracted by something in the surroundings and has forgot about the track, get him gently back to you and show him the track and use the "track" command again. Don't be disappointed when your dog goes off the track. It is his first, and he hasn't understand yet to follow one particular track. He has probably picked up another scent track and is following that. Just stop and let him on his own return to the original track. Dogs are fast learners, they can smell the difference in scents for a track, and will quickly understand that following the same scent gives a reward. It is possible the dog is going slightly beside the track but seems to follow its direction. Don't worry about this, it is probably caused by a change in wind direction, which blows the scent away from the track. The treats you used on the track will draw the dog back to the original track. When you come at the end of the track, stand still exactly at the moment the dog has reached the object you placed. Now is the time to praise! and make it loud! This will teach the dog that he tracks to mark or retrieve an object. Congratulations, you have finished your first track! How was it to have your dog in the lead? This blog started because of my impatience. But before telling more about the reason to blog, let me introduce Kenzo, the inspiring source behind this blog, and also Viva. 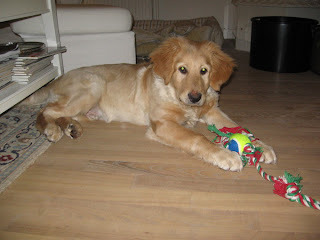 Now 2½ years ago we got our first Hovawart as a puppy. He was called "Sveablik's Igor" by the breeder but we decided to call him Kenzo. A fashion designer my wife seems to be very impressed about. Together with Kenzo we started a happy journey that changed our lives. Just one month ago Viva joined our family. 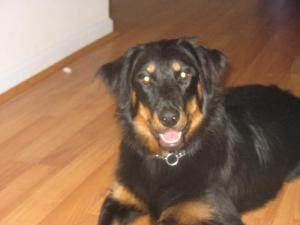 Viva is adopted from the local shelter, 5½ years, and also a Hovawart. Recently I also started using Twitter in Kenzo's name (@Kenzo_HW). Which brings me back to why this blog is started. Trying to help fellow tweet @kimhalligan1 to learn her dogs to track and do nose work, I tried to find a good source on the internet how to lay/do your first track. I could'nt find any links for her that were good enough. And decided to write it myself. First I polled Twitter if any bloggers out there would be interested in my article, but no immediate response pushed my impatience button. So there you have it, another blog is born. From a passionate dog owner for dog lovers. Expect blog posts about Kenzo, Viva, the Hovawart breed and a lot more. But now first the article I promised on tracking to @kimhalligan1. Coming soon!